With the 2019 RYA Dinghy Show all wrapped up, we want to show you photos the CST Team took whilst over there. Stay tuned for more coming at the end of this week! Sunny Skies, with the combination of waves and swell made for exciting and challenging sailing this weekend. Congratulations to Greg Junk and Ari Hume on Ella for winning the CST Composites MG14 State Titles, held at the Cronulla SC. Looking back on 2018 and into the year ahead, the 2018/2019 Australian Titles was a great year for CST Composites, our Team Sailors and everyone sailing CST products. We are proud of all our Sailors and their achievements, wanting to thank them for their continued support. Team Sailors Josh Mcknight winning 1st place & Luka Damic winning 2nd. On the 16th & 17th, Feb CST is proudly sponsoring the MG14 NSW State titles, hosted by the Cronulla Sailing Club. It’s going to be a fun filled day and we hope to see you there! The team at CST Composites will be attending the Marine Equipment Trade Show in Amsterdam from the 13th November through until the 15th Nov 2018. The guys over there will be happy to meet with you and discuss the capabilities of CST and what products or services we can provide you. Contact us at https://www.cstcomposites.com/contact-us/ and we can arrange a time to meet. In 2017 and earlier this year, CST has been a sponsor for the team at Technico Solar Boat (TSB) and provided them with composite carbon fibre tubes to be fitted into their solar boats. TSB is a university project consisting of engineering students from Instituto Superior Técnico that work together on the development of a racing vessel exclusively powered by the sun. TSB participates in worldwide university competitions organised by solar 1. Here at CST, we saw what TBS was trying to achieve and wanted to support them and their cause. The competition such as the Solar 1 Monte Carlo Cup in Monaco (which TBS competed in, in 2017) are put together to raise awareness and encourage technological innovation in solar energy. Meeting the energy needs in both leisure boats and the shipping industry in an environmentally and sustainable fashion. We are a big believer in environmental and sustainable energy at CST and it was a no-brainer to support TBS in the 2019 Solar 1 Monte Carlo Cup and to support a team of brilliantly clever engineers that are paving the way for the future. Check out Técnico Solar Boat website to find out more and give them all the support! Make sure to check out our website and YouTube channel to stay up to date on all CST activities and events. 18 Footers over the many years since their conception in 1892, developed from timbers boats to high tech carbon fibre, reducing the number of crew members needed over the years from 20 to only needing 3. In 2012 a young innovating skipper by the name of Jonathan (Jono) Whitty came to CST to help create his latest concept, the “Wing Mast”. Not only did we supply Jono with the engineering and production to make such a mast but we were determined to make sure it would point towards the sky as well as be fast. We are proud to announce that we have achieved recertification for both manufacturing facilities under the new ISO9001;2015 standards. As a growing business, we guarantee to our customers a professional and transparent operating/organisational system that meets the standard recognised by over 168 nations around the world, through this recertification. This allows customers past, present and future to have peace of mind that CST will provide a world leading professional product in a cost effective and timely manner for the mining, industrial and marine sector. 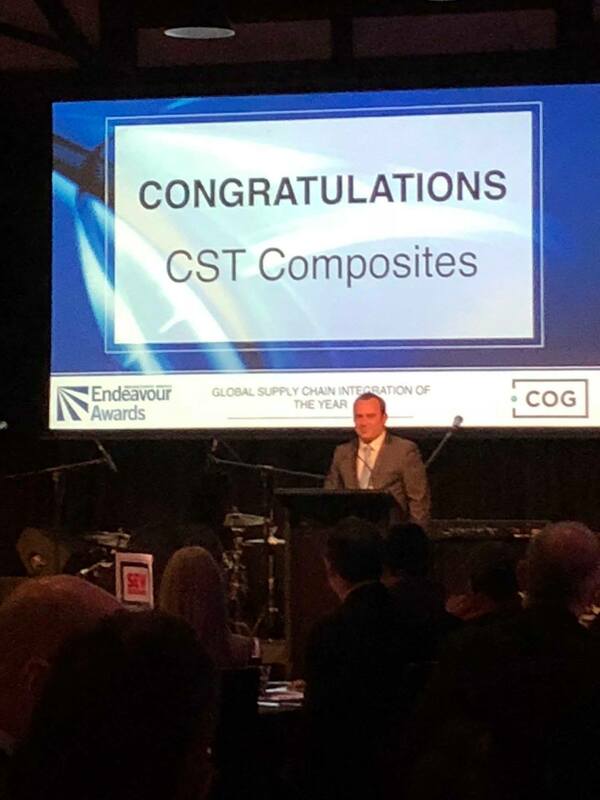 CST was proud to receive the GLOBAL SUPPLY CHAIN INTEGRATION AWARD at the Endeavour awards last night in Melbourne. We were in good company as we were able to edge out other finalists such as Boeing and BOC. The award is recognition of our success at being able to tap into global supply chains with innovative and cost competitive components while still being based out of Australia. Chis Dixon, CST’s GM was on hand to accept the award.